Goodness. 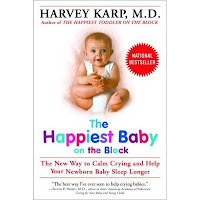 I finally was able to get my mom to watch the video by Dr Harvey Karp - The Happiest Baby on the Block. These are the different techniques he's teaching to calm crying and fussy babies. Ever since my mom came here in Arizona, she questions how come me and hubby are swaddling Anikka tight before putting her in her swing to sleep. She said she feels sorry for the little kiddo because she can't move freely. Plus she also questions what's up with the white noise we play when we put my baby to sleep at night. I was about to go insane trying to explain when I realized it would make sense for her to see the video herself. We owe this video bigtime (and of course my good friend Jes who gave me this video as a gift) as to why at 8 weeks old, Anikka started to sleep through the night - 9am to 6am. Yep, that's right 9 to 10 hrs of sleep. Either we're just one of the lucky few that Anikka's been really good or Dr H's 5S system works (Swaddling, Swaying, Shushing, Swinging, Sucking). So, if you're a new parent, or about to become parents, don't miss out on this video. Goodluck! thanks for the tip, Berns! we'll definitely get one of this, too. terrence din..hanggang 4 months yata naka swaddle pa... but i didn't get to watch any videos. i just figured it out on my own kasi di sya makatulog ng walang swaddle. buti na lang na outgrown na at 5 months (LOL tanda na...) i have to use his blanket na by that age.